Can the federal cleanup program return to its "polluter pays" roots? John Abbotts, former Sightline staffer and long-time observer of cleanup efforts in the Northwest, contributes occasional articles to Sightline’s blog. “The polluter pays”: it was supposed to be the guiding principle of the federal Superfund program. But a decade and a half ago, Congress neutered Superfund’s polluter pays principle, pushing cleanup costs from polluters onto taxpayers. Is there a chance to return Superfund back to its “polluter pays” roots? It’s a long shot, but maybe so. The original Superfund legislation enacted by the US Congress in 1980 gave the Environmental Protection Agency the authority to clean up heavily contaminated sites. To pay for the cleanup, EPA was allowed to recover costs from the original polluters. But for some sites the polluters had long since declared bankruptcy or otherwise ceased to exist. To clean up these “orphan” sites, Congress established a trust account—the so-called “superfund” after which the program was named—funded by excise taxes on petroleum products and certain hazardous chemicals. A corporate environmental income tax, imposed on large corporations based on alternative minimum taxable income. The tax rate was 0.12% ($1.20 per $1,000) of alternative minimum taxable income above $2 million. At the end of 1995, though, Congress let those taxes lapse. And since then, “Superfund” has been neither funded nor all that super. By 2004, the trust fund was nearly empty. 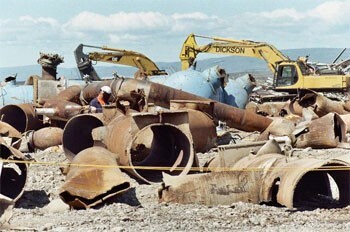 And as a result, taxpayers, rather than polluting industries, had to pay to clean up orphan sites. By 2009, EPA’s National Priority List for cleanup had grown to over 1,100 sites, and the Government Accountability Office, the auditing arm for the U.S. Congress, reported that the estimated costs for cleanup exceed EPA’s current funding levels. The Superfund received an infusion in last year’s federal stimulus package, which included about $600 million in spending on non-federal Superfund sites, and nearly $6 billion for cleanup at Superfund facilities owned by the U.S. Department of Energy, including nearly $2 billion for the Hanford site in Washington State and $467 million to the Idaho National Laboratory. But for a more lasting financial remedy, the administration, through EPA, has requested that Congress reinstate the taxes that previously supported the Superfund Trust Fund. It’s a modest request, since the fees wouldn’t be adjusted upwards for inflation; yet they would still provide about $19 billion to the Trust Fund over the next 10 years. New Jersey Senator Frank Lautenberg, whose state has the highest number of Superfund sites (111, as of September 2010), introduced a bill to reinstate the Superfund fees; Northwest cosponsors include Senators Merkley (OR) and Murray (WA). Representative Earl Blumenauer (OR), whose district includes most of Portland, has introduced companion legislation in the House. His concerns include the Portland Harbor Superfund site, for which some responsible parties remain unidentified. House co-sponsors from the Pacific Northwest include Representatives De Fazio (OR), Dicks (WA), Inslee (WA), McDermott (WA), and Wu (OR).